Start spreading the news! The 2016 Cadillac CT6 has rolled into town and now leads the range. Teased earlier in a Super Bowl ad, Caddy’s new range-topper has been unveiled in all its glory at the 2015 New York International Auto Show (2015 NYIAS). First things first, the way it looks. The 2016 Cadillac CT6 sports what the marque calls “a dramatic dash-to-axle ratio” which supposedly gives the car its distinctive silhouette. Up front, the CT6’s face is framed by exotically-shaped Indirect Fire LED head lamps. The trailing edges draw one’s attention down towards the slim air intake aperture, replete with LED daytime running lights. The rear of the car is kept tastefully simple with a quad-exhaust outlet configuration. As for its dimensions, the 2016 Cadillac CT6 measures in at 5,184 mm in length, is 1,879 mm wide and stands at 1,472 mm while the wheelbase spans 3,106 mm. In other words, just about the same as a short wheelbase BMW 7 Series. Under that relatively long bonnet, sit three different engine options. First up is a turbocharged, 2.0 litre four-cylinder engine pumping out 265 hp. Next up, a 3.6 litre V6 engine produces an estimated 335 hp takes the middle slot while a twin-turbo, 3.0 litre V6 sits at the top – it produces 400 hp and 543 Nm of torque. All three options are mated to an eight-speed automatic transmission that sends power to the rear wheels on the four-cylinder version – the six-cylinder models get all-wheel drive as standard. Coupled with Active Chassis System, the CT6 possesses active rear wheel steering and Magnetic Ride Control. Stepping inside, driver and occupants are greeted by an extravagant interior that combines “luxurious leathers, exotic woods, and carbon fiber in unprecedented ways.” Taking centre stage is a massive 10.2-inch touchscreen CUE infotainment system with a 360-degree camera that possesses recording functions. Other conveniences come in the guise of Enhanced Night Vision, Advanced Park Assist and wireless phone charging with OnStar 4G LTE WiFi connectivity. At the tauke end of the interior, the 2016 Cadillac CT6 features an Articulating Rear Seat package that offers up to 83 mm of seat travel (on top of a legroom capacity of 1,027 mm) along with lumbar adjustment and massage functions. Rear seat entertainment gets taken care of with the adoption of two 10-inch screens. Further goodies to spoil the occupants rotten include a Quadzone climate control system that allows for a personalised temperature and airflow for each passenger. 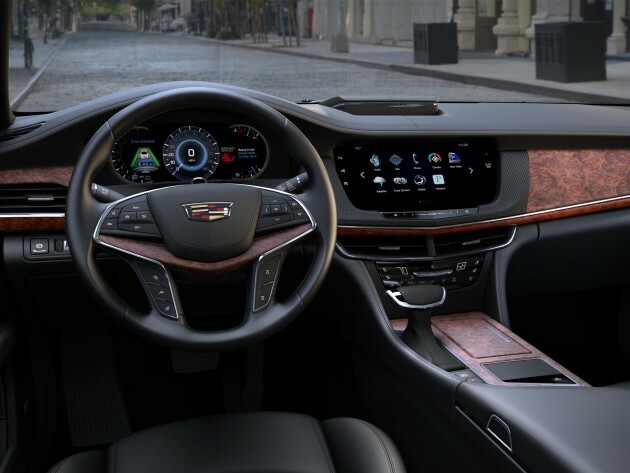 On top of that, audiophiles will be pleased to know the CT6 comes with Bose’s Panaray sound system that employs up to 34 speakers throughout the cabin. Hyundai tries to enter the F-Segment US market with the Genisys. It was a total failure. You seriously need to check your eyes dude.. This is Cadillac, not Hyundai.. I dont think his eyes are the only things he needs to chck…he needs to go on a RV vaccine! No one said that the published car is a rotten cabbage. Yes, it definitely won’t get mistaken as a German or Japanese car, but not distinctive enough to set itself apart from Cadillac’s own lineup. It looks too much like a stretched CTS. And Cadillac always fails in getting its cars a nice odometer. A flagship model with an odometer that looks like that on the Honda CRZ? I don’t find that luxury-looking. I do believe that screen is customisable – maybe you can have the normal speedo in a separate counter. You could probably watch a movie in there too. Somehow, the exterior design doesn’t quite look as good as the CTS & ATS. Both those cars look awesome. Thankfully, the part you will see and touch the most (the interior) is very nice & minimalist, without looking boring (*cough* BMW). But notice how low the central AC vents are? As the place where you normally put them now has one (or is it 2?) of the gazilion premium speakers on the car. The soundsytem might just blow the doors off. What’s wrong with the old nameplates? This would either be the Seville or the Deville. I like that Cabin. looks like a mini space shuttle, especially that gear knob …. Nice car….any news for the range topping cadillac CT nurhaliza?? When Cadillac ct6 will out in Malaysia? And price will be what price can anybody tell me? Next Post: W205 Mercedes-Benz C 160, possible BMW 316i rival?